"Floating in a hot air balloon feels as if you're suspended in the wind. The earth appears to be turning below. The horizon rises as you dip to kiss the treetops, then falls away until the landscape spreads to incredible dimensions. A mere whisper of wind on your cheek tells you that the balloon has changed direction, moving with the breezes through the crystal blue sky." Each balloon flight is a unique experience. Flights are usually at dawn when the winds are the calmest. 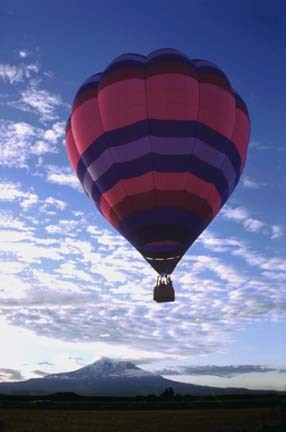 In fact, hot air balloons are launched only if the winds are less than 10 miles-per-hour. The pilots and the balloons operate under F.A.A. regulations. The balloons usually fly about 1 hour. It is not much colder in the gondola than it is on the ground. Only about 3 degrees cooler per thousand feet of altitude. Balloon Instruments include an altimeter, variometer (rate of climb) and a pyrometer (temperature gauge). allowing the air in the balloon to cool slightly.